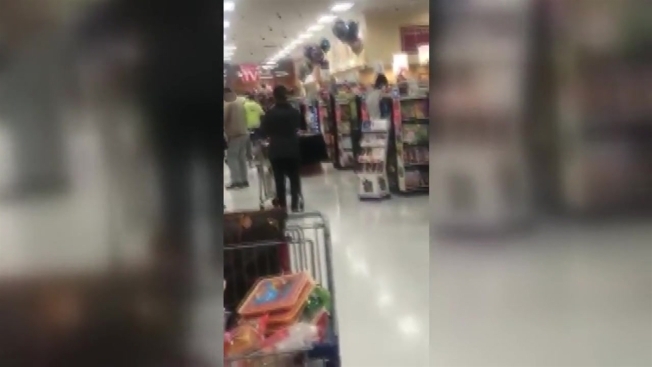 A Hamden Public Schools employee has resigned after she allegedly was caught on camera using racial slurs at a supermarket in East Haven, Connecticut, on Friday. The incident took place at ShopRite on Foxon Road, according to Hamden Mayor Curt Balzano Leng. "The video appears to show the employee repeatedly calling an African-American man the N-word," according to a statement from Hamden Public Schools. The video also appeared to show the woman spit at the man. Hamden Public Schools Superintendent Jody Ian Goeler identified the woman as Corinne Terrone, a clerk in the school board offices. The video also appears to show Terrone's children witnessing the conduct and because the children were there, school administrators filed a report with the Department of Children and Families, the statement said. After learning about the incident, the district’s Human Resource Director contacted Terrone and arranged a meeting with her. Shortly after arrangements for the meeting were made, school officials said Terrone gave her resignation, effective immediately. "The language the employee used in the video is in conflict with the values of the Hamden Public School System. Someone who will use that sort of language in any setting, whether public or private, is not someone we want anywhere near our children. The employee is separated from service, and we hope that her children will receive the support they need after witnessing such a traumatic event," the statement said. Terrone has not been charged in this incident. East Haven Police said they are aware of the video and are investigating the incident. "We are urging any potential victims of last night’s incident to contact us so we can investigate this matter further. Speech like this has no place in today’s society and nobody deserves to be spit at or called racist names," a spokesperson for the police department said. Police said they have not been contacted by anyone directly involved in the incident at this point. "What I saw was vile and shocking. While I am disgusted and disheartened seeing such hateful behavior, wildly unacceptable anywhere, I am thankful for the swift and effective actions taken by our school system to address this head on and make clear that hate and violence will not be tolerated." NBC Connecticut has not been able to reach Terrone for comment. We have also reached out to ShopRite, but haven't heard back. We have become aware of video footage that appears to show an employee in our district engaged in abhorrent conduct. Specifically, the video appears to show the employee repeatedly calling an African-American man the N-word in a supermarket in East Haven. The video also appears to show the Hamden employee spitting at the aforementioned African-American male as he was walking away from the employee. It also appears that the employee’s children witnessed her conduct. Because her children were present, school administrators filed a DCF report. While it appears as though this happened after work hours on Friday evening, the Human Resource Director contacted the employee and arranged an investigatory meeting with her. Shortly after final arrangements were made for the investigatory meeting, the employee rendered her resignation effective immediately. The language the employee used in the video is in conflict with the values of the Hamden Public School System. Someone who will use that sort of language in any setting, whether public or private, is not someone we want anywhere near our children. The employee is separated from service, and we hope that her children will receive the support they need after witnessing such a traumatic event.